In case anyone with a serger wants to make super easy, super fast, super hero capes. It’s cheap too. 1 yard of symphony broadcloth on sale for $1.99, felt .25 and a roll of ribbon .99, for a grand total of $1.65 per cape!! If you don’t have a serger, see option two at the end. 1. 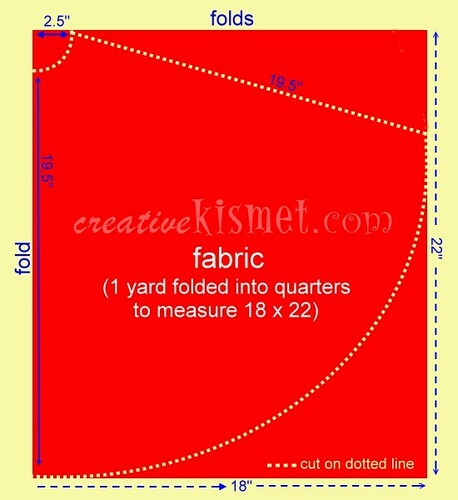 Fold the fabric into quarters (you will be cutting two capes at one time). Use the diagram above and cut out capes. I used a pencil and string to make my own drafting compass for the rounded bottom and this for the neck. This fancy contraption would work too (I secretly want one of these). 2. Set your serger on rolled hem setting and hem around all edges – neck, sides and bottom. Repeat on second cape. 3. Cut out 4 felt strips (2 for each cape), 2 x 4 inches each. Round off one edge on each strip. Now cut 4 squares, roughly 1 x 1 inch and trim with pinking shears if desires. Place square over ribbon edge and sew onto strip. 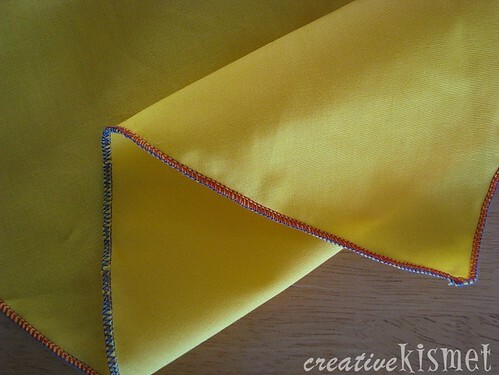 Sew other end of strip onto cape with a simple zig-zag stitch on a regular sewing machine. Add a circle of white fabric to back with double-sided iron-on interfacing. Stitch around the edge and let the kids decorate with markers or colored pencils. If you don’t have a serger, you can do a rolled hem on a regular sewing machine by doing a double fold along the edge, press and then sew. Or you can make one cape out of both pieces by sewing them together along the side and bottom edges, leaving the neck open to turn right side out. Use bias tape to close up the neck. Now watch your kiddos S O A R ! ! ! This entry was posted in Fun kid stuff, Sewing, Tutorials, how to and tagged cape, easy, how to, serger, Sewing, super hero, tutorial. Bookmark the permalink. I love this cape. I’m going to make two for my boys this weekend!!! Great tutorial, I made a black velvet cape for one of my kids for a dress up once and it has been the most popular dress up item of them all. The kids just love it. The best thing is that they are quick,easy and inexpensive to make, fit all shapes and can be used for lots of different characters. Another great idea! Too bad I don’t have a serger, but I suppose I could try one without? Pinking shears? pinking shears would totally work for this. Firstly GO AQUABATS! Thank you for posting their lyrics. You are super rad too my friend. Secondly, great idea. I’m adding a few more feet and making one for Halloween next year for my adult self. what a great idea for a birthday party! 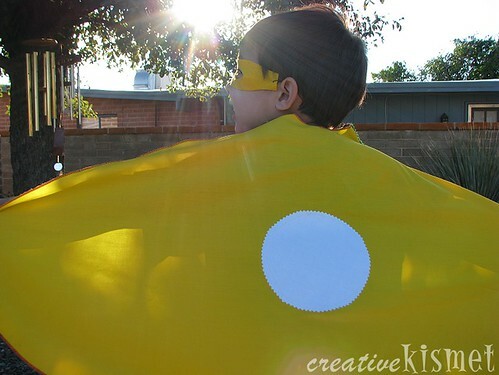 i made a cape for my son for halloween – it would’ve been great to have your helpful tutorial. the enthusiasm of your model is fantastic. 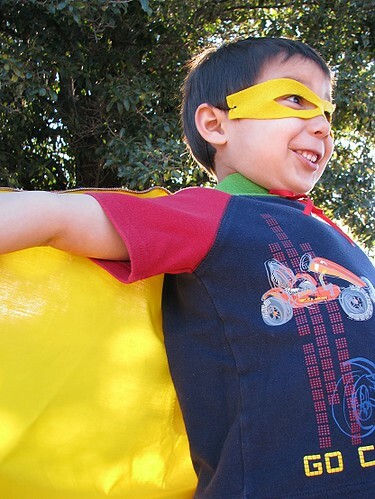 Kids love superhero capes and they are great for hours of imaginative play, but just have one suggestion and safety tip – to avoid a choking hazard (as little superheros tend to run too fast and get get their capes caught on all sorts of things) is to use velcro either instead of strings or to attach the felt area so it will break away or be easier to get off if the cape gets stuck on a bunk bed post, a slide or in a door they are less likely go choke or become injured. 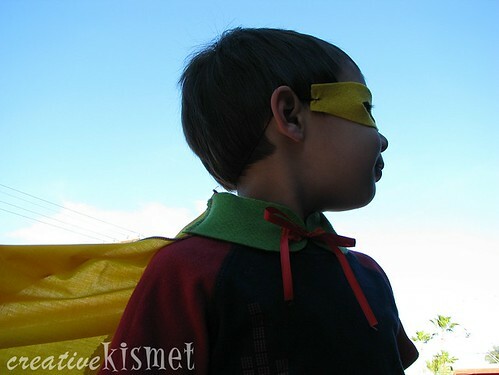 Thanks for providing me with a super craft idea for my superhero parties! finally! something I can make for a boy! lol. great tutorial!! awesome! 24 cheerleaders will be wearing these on ‘hero’ day at cheer camp!! 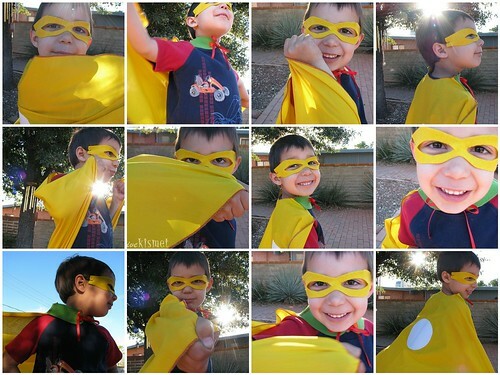 I went on flickr searching for a super hero party and came across yours… hooray! you are just the inspiration I needed. I love your blog and I hope you don’t mind if I borrow a couple of your party ideas — the DIY capes (I was just going to make them for all o them, but it would be fun for them to make it!) and the peg superheroes. darling! Now I need to search your blog for more party details! THANK YOU! I’m going to give this a try tonight. I don’t have a serger but I will try option two, right sides together and turn when down. I will let you know how it comes out. thanks so much l have been looking for ages for a pattern for this to make for my grandsons, l am sure that they will love them. super idea. I am looking for a simple pattern for my little superheros. Thanks for saving me time on how to make this cape.I am making capes for my superheros at work will be adjusting pattern for size. Thanks again. Love this! I just made one for my son and he’s “flying” around the living room. Thanks! Just wanted to send a quick note thanking you for this tutorial! I made a bunch of these capes for my 4-year-old’s dress-up party and the kids had a blast! Thanks! Thanks so much for these excellent instructions! I just made a gorgeous hot pink grosgrain satin superhero cape for my goddaughter’s 4th birthday. I used another piece of felt to do a big letter M on the back (her initial). It came out so much better than if I’d had to wing it. Thanks again! What’s the “fancy contraption?” The link doesn’t work. I just spotted you over at The Crafty Crow. Awesome tutorial. Super fun! I just made 8 for my grandson’s Super Hero birthday party! Thanks so much for the easy tutorial! Made two of these tonight. One for my little boy and one for his best friend’s birthday this Saturday! Thanks for the great tutorial!